In your attempt to become a fully knowledgeable certified real estate agent, enrolling in the real estate certification program offered by Brainmeasures can offer you the kind of help that you desperately need. The real estate course which you can now access at Brainmeasures is developed by real experts in this industry so you have a hundred percent assurance that this will allow you to gather the most detailed and accurate information about the field. This certification course from Brainmeasures makes it a point to let you receive a kind of real estate training which is guaranteed to help you improve your skills as a real estate agent as well as strengthen your understanding about all the essential concepts and areas related to this field. With the help of this certification course, you will also become more familiar about the duties and responsibilities that you hold as a real estate agent and the many legal requirements that you need to follow when conducting real estate transactions. 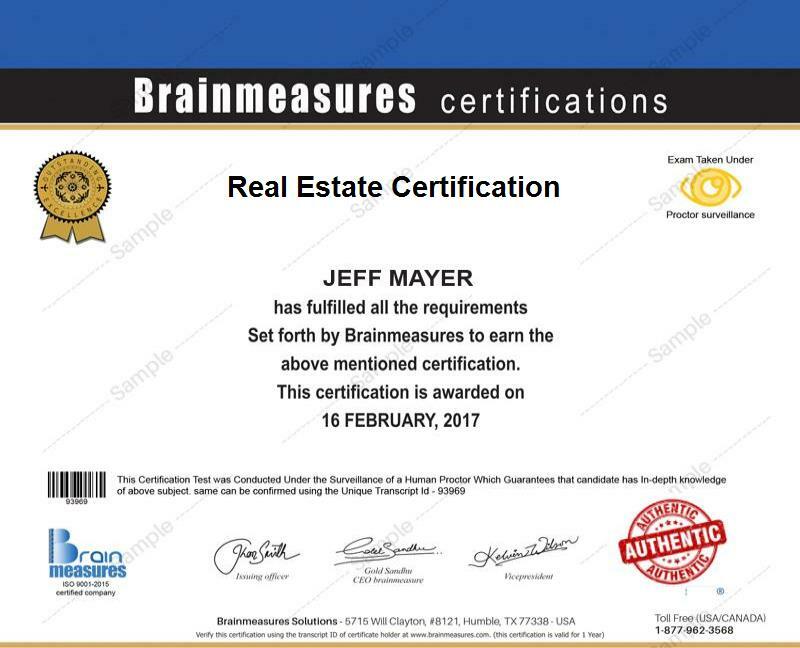 The real estate certificate that you will receive from Brainmeasures is a major help in letting the public know that your knowledge and skills in this specific field are of the highest quality. How to deal with real estate buyers? Hundreds of professionals who are planning to enter the real estate industry are going to be benefited by taking part in the real estate certification program offered by Brainmeasures. This certification course is most ideal for executives working in small and large real estate corporations who are responsible in acquisitions and dispositions, asset management, leasing, investment, finance and construction and development activities, corporate real estate executives, facility managers, building operations professionals, real estate agents and property managers. Increasing the current level of your salary is also possible after you receive your real estate certification and start working in the industry. You can use your real estate certification to get the position of a real estate analyst which gives you the chance to receive around $48,000 to $80,000 per year. Working as a real estate agent is also rewarding because it allows you to earn around $60,000 to $105,000 annually. You may also work as a real estate consultant which is a huge help in receiving as much as $120,000 annually.